Since I’ll be going to the “Flying Through the ’30s” Symposium organised by the Croydon Airport Society and UCL this month, I thought I’d look at Geoffrey’s experiences as a Commercial Trainee at Croydon. I think the biplane on the left of the picture is a Heracles, the workhorse of the Imperial Airways fleet. 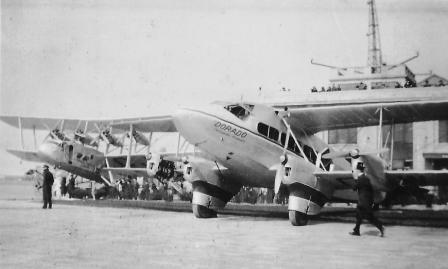 I’m not sure what the one in the foreground is but it looks very snazzy and modern – this was in 1935; I thought there was a gentleman in a top hat, but I think it’s actually a peaked hat with an inlet on the propeller cowling behind! That might be a steward or purser standing by the Heracles looking well wrapped up. In the background is Croydon’s air terminal and radio tower. I’m sure Geoffrey felt a thrill when he worked at Croydon as part of his training. They seemed to spend three months learning each of the different departments, and at Croydon there was the Met Office, where not only did they do a course, but they had to prepare weather forecasts as well. Geoffrey recalls the day he set a new height record for sending up a weather balloon – and then had to spend the rest of the afternoon working out all the changing air conditions according to his measurements! I think the accounts department was also at Croydon. Here is the extract of Croydon pictures from Geoffrey’s album. 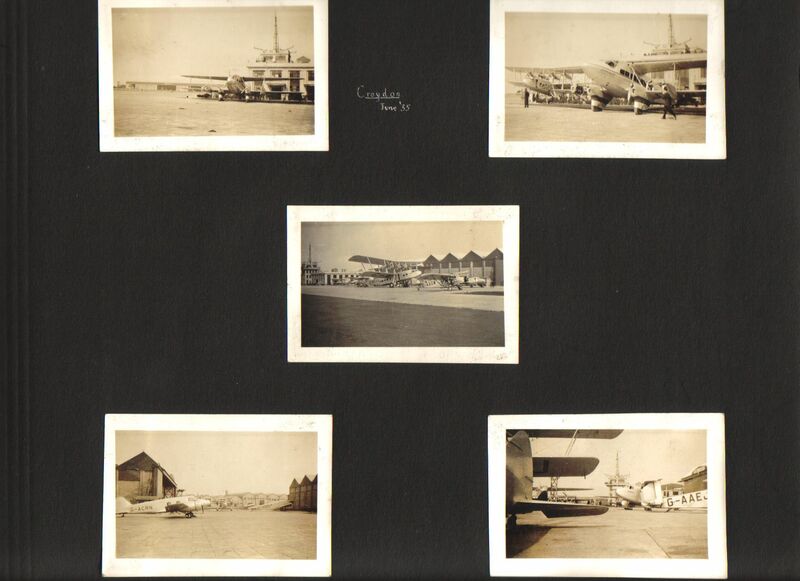 Top left is the Heracles as in the main picture: this gives a better view of Croydon’s attractive terminal building. Top right is the main picture above, centre is a Heracles in front of the hangars, with the terminal and tower in the far left, and also in the background of the bottom right picture. I’m happy to receive information about the plane in the bottom left. If you’re coming to the Croydon Symposium on the 16th, then you’ll be able to read what he said about his Met Office course at Croydon, as I’ve printed an extract of this and a few other things. Of course, you could just buy the book, and read it at your leisure. I’ll have both paperback and hardcover books available, plus vouchers for ebooks. Stop by and say hello! I’ve just finished White Water Landings, and wanted to say how much I enjoyed it. Thank you for putting your father’s memories into the public domain. Sorry I won’t be able to make it to Croydon on the 16th. Thank you, Sally! If you feel up to leaving a short review or just a star rating on Amazon or wherever you bought it, that would be a huge help for other potential purchasers. Thank you so much and I hope you come back to this website again.